I first worked with Avis and Thomas for their maternity session in the studio, which can be viewed by clicking here. They welcomed Eden on Halloween, and I will never forget opening an email from Avis that day with the announcement that she was here and an attached photo of all of them wearing costumes in their hospital bed! 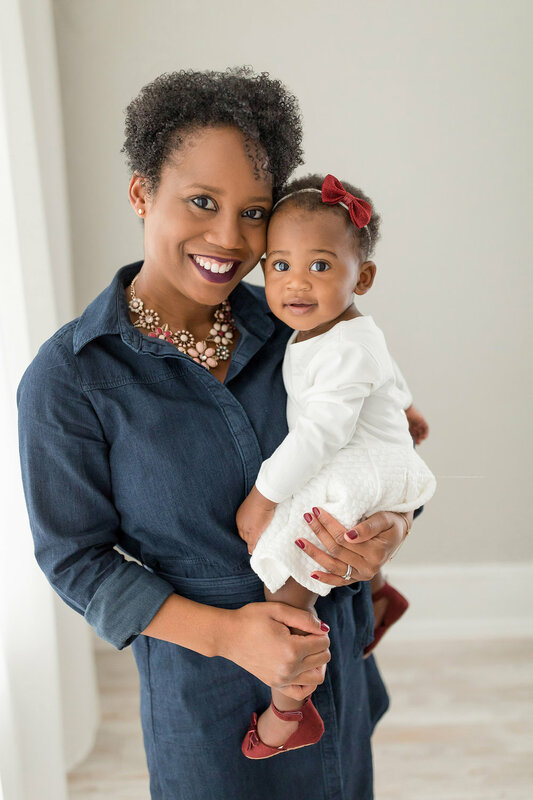 When Avis contacted us schedule a First Birthday session for her daughter, Eden, I was SO excited! Because of food sensitivities, Avis decided to work with our recommended baker to create a vegan cake. Our recommended baker is local to the studio and can deliver your cake directly to the studio so you don’t have to worry about picking it up or forgetting it. Smash cakes are NOT required for First Birthday sessions, but many clients do love including them as it’s a chance for their baby to have some fun without the pressure of being watched by lots of people. Parents also enjoy being able to watch and take in all the funny moments without trying to document it all themselves. 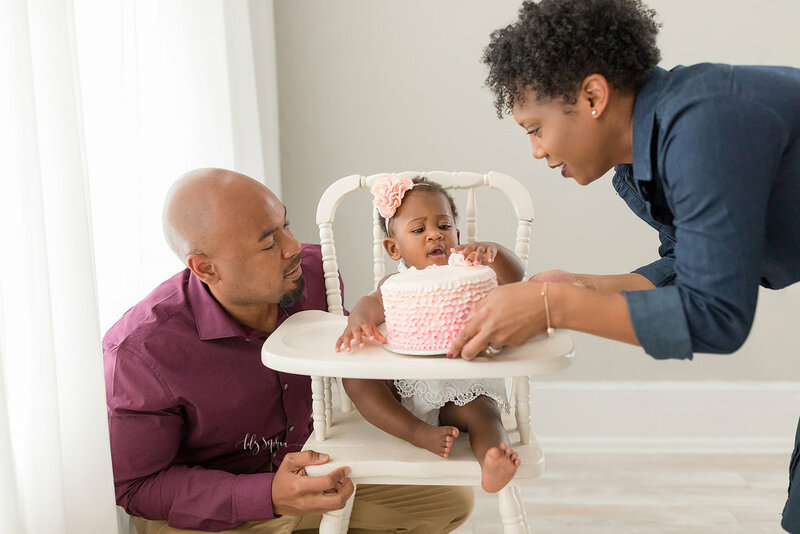 If you choose to include a cake in your baby’s First Birthday session, we’ll go over our recommendations for cake type, icing type, color, design, etc. Our goal is to make everything as easy for you as we possibly can! 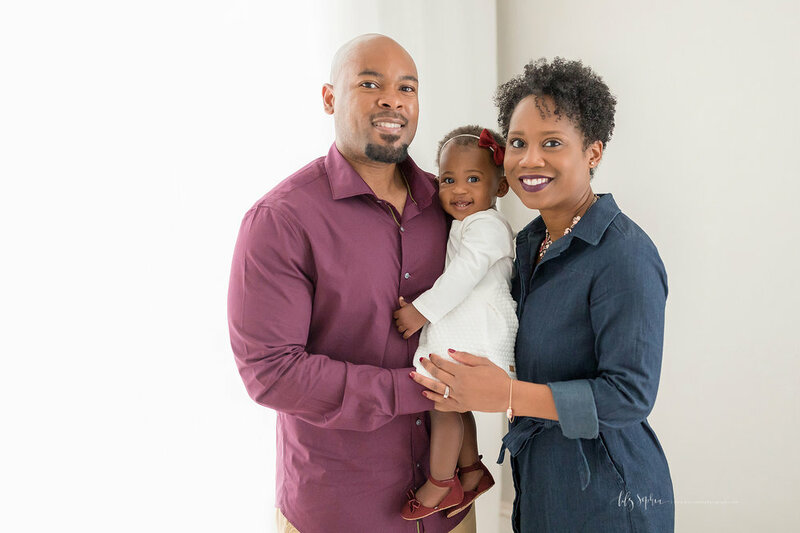 We also sent Avis our style guide so that she could plan her family’s wardrobe choices. She emailed over a few photos of outfits for me to look at, and I confirmed that her choices looked great! On the day of the session, I arrived at the studio to take delivery of the cake, and welcomed the family shortly thereafter. 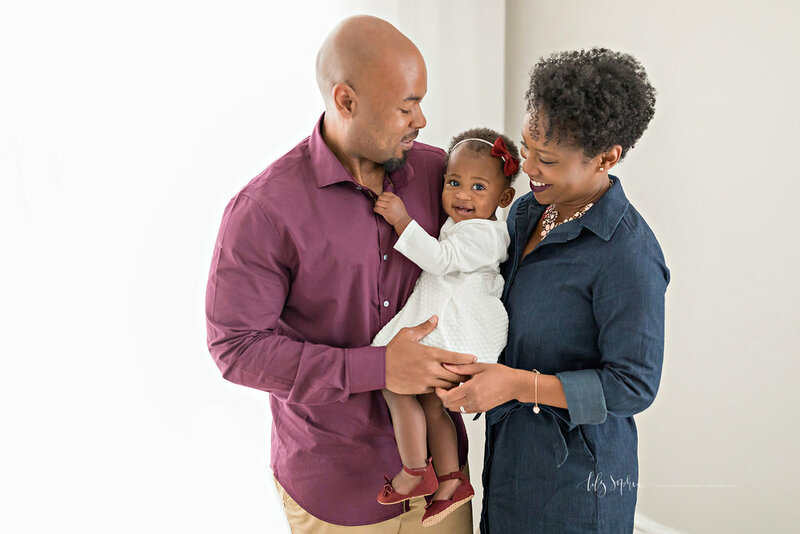 It was so wonderful to see Thomas & Avis again and to meet their beautiful little girl! She was a little bit reserved, but very curious to know who I was. Because she wasn’t frightened of me, we started the session off with a few images of just Eden. 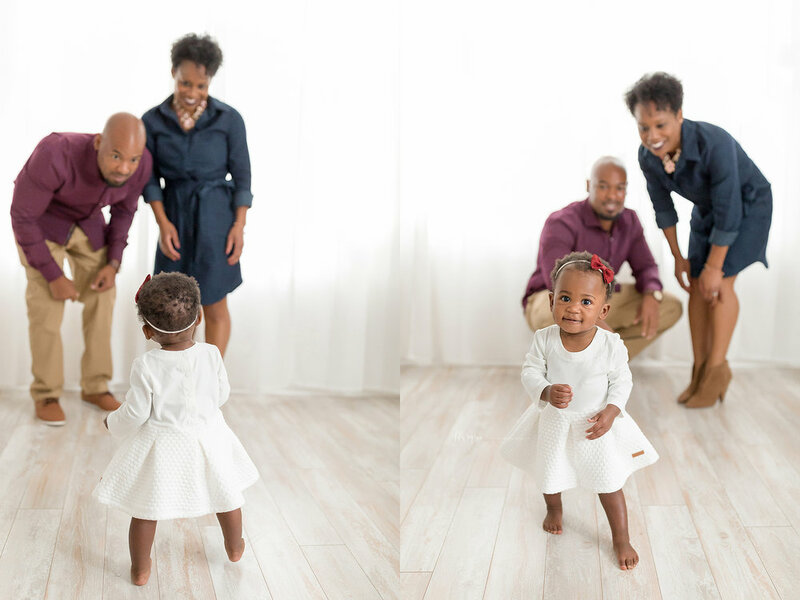 I loved the cream dress her mom had brought for her and accessorized with adorable burgundy shoes and a bow headband! Those accessories were tied together with daddy’s shirt color and mom’s shade of lipstick. They looked amazing, and did such a great job! Thomas was a much more willing participant for this session - I won him over during their maternity session. ;) I loved watching them with their daughter, and we all had so much fun. After we finished our family and solo portraits portion, Avis dressed Eden in her special birthday outfit. I thought her tutu and pearls paired with a simple white onesie were absolutely adorable. 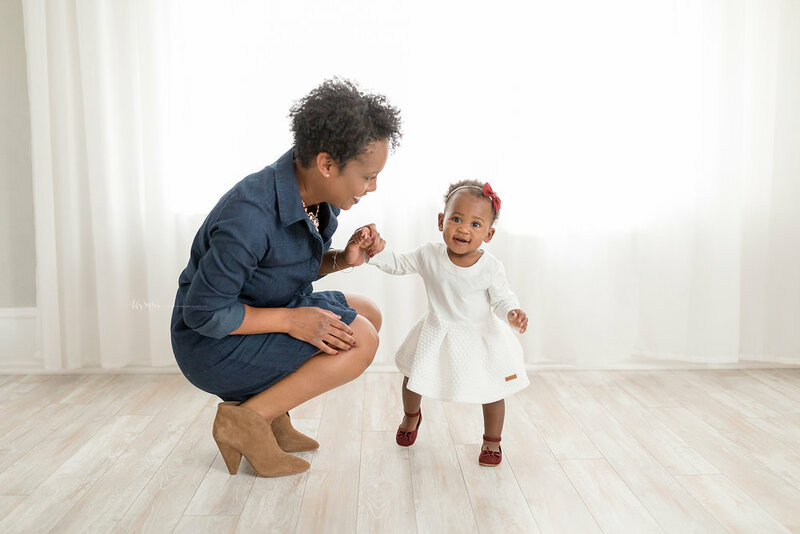 Eden was already walking, so we spent some time playing together on the floor, and running around all over the place. Once we finished with that, I pulled out the high chair, and the cake fun began! Eden was immediately interested in her cake, and mom and dad came over to join in as well. I will never forget Thomas taking a bite of the icing and the look of shock on his face. I asked him if everything was okay and he nodded. He said “I just can’t believe this cake is vegan! It’s really good!” Avis looked at him and tasted it and said, “Oh my gosh this is amazing!” Our baker really is incredible - her cakes always get taken home for enjoyment no matter how smashed up they get during the session. I order birthday cakes and special event cakes from her - nobody else in Atlanta comes close to the flavor and amazing design she creates. 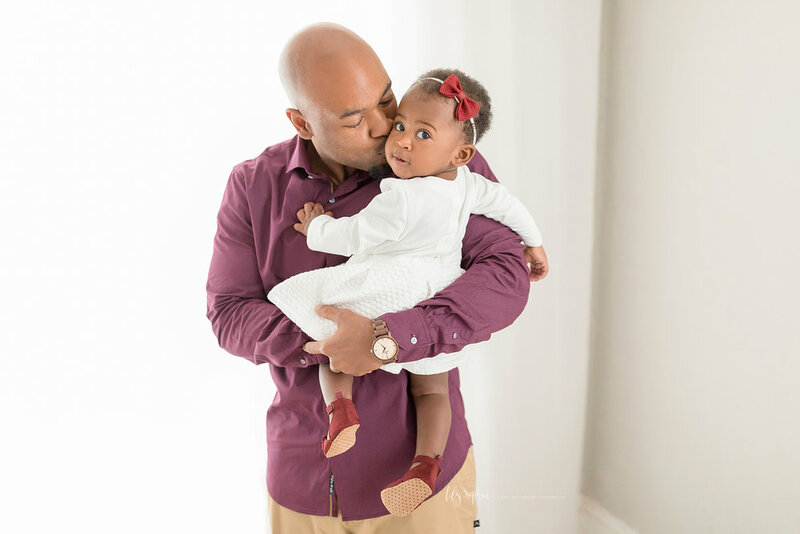 Here are a handful of my favorite images from Eden’s first birthday celebration!